Why don’t we keep baby turtles? In answer to the common question “why don’t we keep baby turtles” and grow them bigger before releasing them; first lets explore why people would, and do, do this. 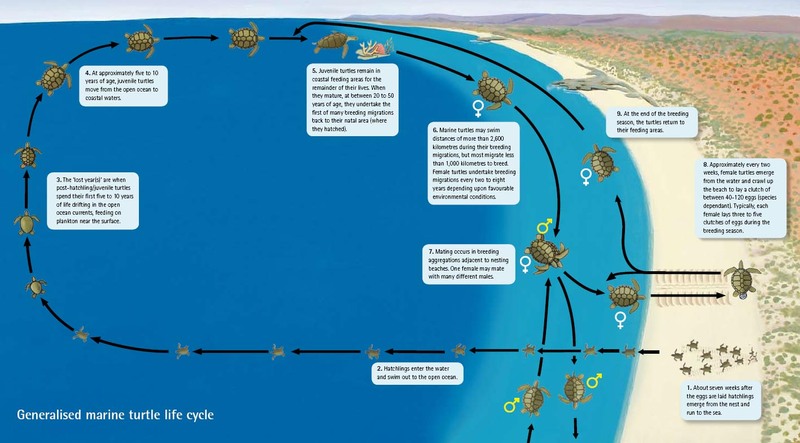 So, why would one think to keep baby sea turtles? 1) To grow them big and strong; to give them a head-start on life. Yes, but actually this disrupts the turtles natural life cycle and confuses their time based instinct program (see more below). You could think of it like; as their bodies get bigger in the tanks, their minds get dumber and or more confused. 2) To stop predators from attacking and eating them; to help them to survive. Yes, but actually this disrupts nature. Natural predators have never endangered the survival of the sea turtle species. Human created issue are the ones endangering them, and the ones that need to be focused on and approached, not other animals. Additionally and importantly; growing the babies bigger does only not help them.. but it takes attention away from the real threats! 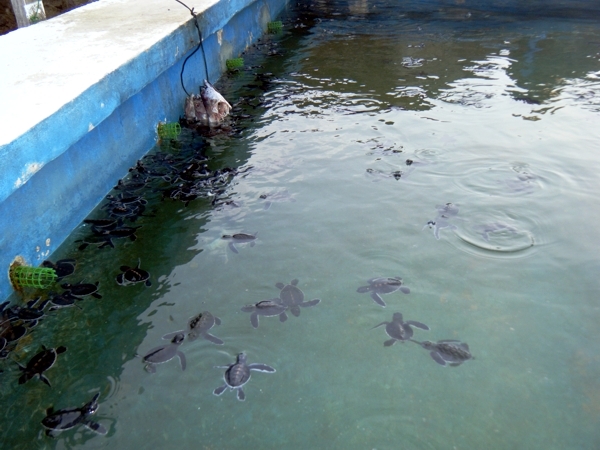 Actually if managed correctly turtles can be kept as a valuable education tool or fundraiser (not a tourist attraction) but for these purpose it is not necessary to keep many babies, especially considering the negative effects. Sea turtles, especially as babies, have a sensitive time based instinct program. A key example is their frenzy period, which is the time when they have just hatched and then swim for up to 1 week away from the beach and into ocean currents. If the turtles are not released immediately, their instincts to swim away from shore (frenzy) continues anyway. When the babies area actually released they ‘think’ they have already swam away from shore and are already in the ocean currents (when they have really just been swimming around in a tank), so they are less likely to swim away and are prone to stay near shore where they are more susceptible to threats like predators, fishing and boat strikes. With all that said, there are many scientific facilities partaking in keeping babies before releasing them. Technically it is called Head-Starting, and it has not been proven or dis proven as beneficial, even though extensive studies and tagging experiments have been done. Certainly it does help them pass from animal threats (assuming they do leave the coastal areas), and most likely they can recover their instinctual programming to some extent. Still the most commonly advised technique is: Get the babies in the ocean as fast as possible, deal with the specie threatening issues, and get out the way of their life cycle! We have decided not to keep baby turtles because it has not been proven to positively outweigh its negative effects. We think it takes a lot of focus away from the serious issues that are threatening the survival of sea turtles and their habitats, and puts a lot of focus on playing with baby turtles. We prefer to use the more natural method of hands-off, and following the guidance of their natural life cycle. It should be noted that you can release as many turtles of any age into the ocean as you want, but if they don’t have protected habitat (beaches to nest on, oceans to swim in, coastal areas to feed) then what is the point? They will all die soon without their supporting environment. Also, we do keep a turtles (in our case a blind turtle named Jo) as an education and awareness tool, because she cannot survive on her own in the wild, and as a fundraiser for other programs and goals we want to achieve here. For those reasons we think it is a fair and good idea to keep her. 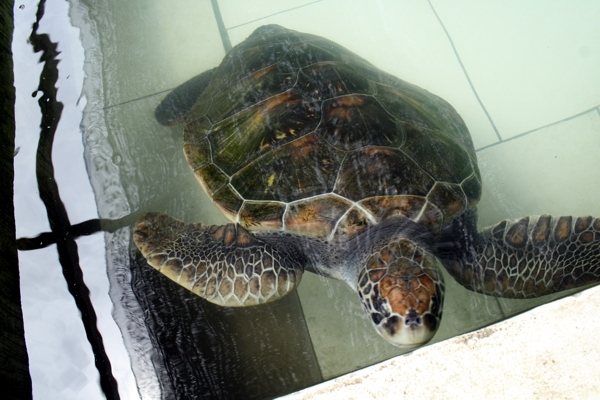 Captivity only benefits her because she will die on her own in the wild; healthy and fit turtles (and the specie in general) receive no benefit by being retarded from their natural life course.